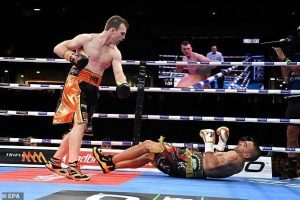 Horn Makes Easy Work of Mundine. 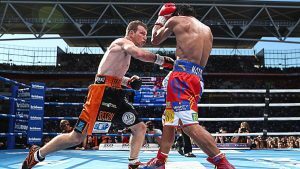 Former WBO welterweight world champion, Jeff Horn took less than two minutes to swat away fellow Australian, Anthony Mundine in Horn’s first fight at middleweight in the pro ranks. Inside a packed-out Suncorp Stadium, the younger man immediately jumped on the front foot and with just less than half of round 1 to go, threw a powerful right to the body, followed up by two left hands to which Mundine didn’t appear to see coming. It sent the 43-year-old falling back onto the canvas and with zero chance of regaining his senses in time to beat the count. ‘The Hornet’ was coming off the back of a brutal stoppage to Terence Crawford in nine rounds, in which he also lost his world title as well as his ‘0’, but his bouts with two future hall of famers in Pacquiao and Crawford, set this fight up nicely for him to prove he’s currently levels above Mundine. Anthony headed into tonight with a 48-9 (28KOs) record and having fought just once this year in a 2nd round knockout of Tommy Brown. This was just his third fight in three years. And it showed. ‘‘It was easier than I expected it to be. I’m happy to have done it so quickly… I learnt that from my last fight, I was a little too stationary and I was getting a few of those straight shots to the body. I got him with that first one and I knew it was just a matter of time. The former welterweight champion seems to now be keeping his options open about what he does next but, whether it’s back down to 147, sticking it out at 160 or the in between of 154lb, Horn will almost definitely make his next fight an entertaining watch. Despite concerns that Anthony Mundine would miss the agreed catchweight for the “River City Rumble”, he bizarrely weighed in lighter than Jeff Horn. Weighing in at 70.25 Kilos compared to Horn’s 70.5, Mundine must now ensure that he does not weigh any more than 75 kilos on fight night. It was an impressive weight cut for a man who’s 43 years old and looks every bit of it. Whether he will be able to recover and perform remains to be seen, but perhaps we should also be concerned about his opponent. Horn has never fought at this weight and the fact that he was heavier than Mundine suggests that he may be in less than optimal condition. If Horn has indeed blown up well past his fighting weight, it could make things interesting if “The Man” can take the Queenslander into the later rounds. Well, the WBO Oriental and WBA Oceania Middleweight titles are on the line, but you get the impression neither of these former world champions would be too impressed by that. Despite the criticisms about this matchup, the outcome could have serious implications on both fighters’ legacies. It should be a straight forward victory for Horn, who gains very little from this fight if he wins, other than a sweet pay-cheque. But what if the unthinkable happens? It’s no secret that Horn has copped criticism for his contentious victory over Pacquaio. Many fans were eager to see him fall to prove that he was a fraud. There’s no shame in losing to a prodigious talent like Terence Crawford, but if Horn was to lose to a 43 year old Mundine, his legacy would be permanently tarnished. All of a sudden he would be that guy who robbed Pacquaio, lost the belt in his first title defence and lost to a 43 year old who even in his prime, was an accomplished but never truly elite boxer. Few Australian boxers have a scalp like Pacquaio on their resume, but there are plenty who have beaten a younger, better version of Mundine. In short, Horn would be ruined. Mundine, on the other hand, comes into the fight as a massive underdog. To say little is expected of him would be an understatement. Three losses in his last five bouts to Joshua Clottey, Charles Hatley and Danny Green, tell the story. He has looked a shadow of his former self, for some time. That said, Mundine has had an extraordinary career when you consider that he switched to boxing midway through a successful NRL career. A three weight world champion with a record of 48-8, and wins over (an albeit diminished version of) Shane Mosley and Daniel Geale, he is without doubt one of the most talented athletes Australia has ever produced. But he could never shake the perception that he always took the softer option throughout his career, particularly when he was a clear pay-per-view attraction. Mundine never fought a truly elite fighter in his prime and despite winning multiple world titles, few pundits ever considered him the best in his weight division. A win over another former world champion- in his prime no less- would provide him with the fairy tale ending he has been craving. It might even silence those naysayers, at least for a little while. If Mundine wins, there are huge implications for both fighters, while a Horn win would change very little. Both men will be paid handsomely regardless. Less than a year ago, Jeff Horn’s camp dismissed the idea of fighting Anthony Mundine as a meaningless money grab that would do little for his legacy. We’re now less than a week away from a catchweight bout between the two at Suncorp Stadium. So what’s changed, you ask? Well, maybe a risk-free money fight isn’t such a bad idea after all. As Fox Sports’ Paul Upham said after Horn’s devastating loss to Terence Crawford, the Queenslander could make more money fighting Mundine than any world-class opponent out there. Not to mention the fact that on paper, it’s probably the easiest fight available. “It’s nothing against Anthony’s skill, I just don’t think he should be fighting at 42,” Upham said. Mundine is now 43 and that coveted payday has almost arrived. Love him or hate him, “The Man’s” numbers speak for themselves. All of his professional bouts have been televised on pay per view. Four of them are in Australia’s Top 10 pay per views ever. It’s been estimated that his 2006 fight with bitter rival, Danny Green, did around 200,000 pay per view buys- the highest grossing pay per view fight in the world (per capita) for some time. It even outsold Mayweather vs Pacquaio in Australia. 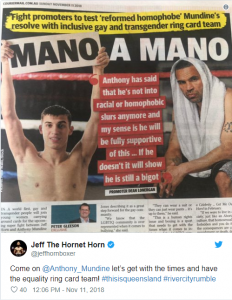 Horn’s been no slouch either, his fight with Manny Pacquaio was one of Australia’s highest selling pay per views, and was staged in front of a sellout crowd of 80,000 at Suncorp Stadium, and a worldwide television audience of 4.4 million people. Put these two Aussie World Champions in a ring together and you’ve surely got a mega-fight on your hands. But ticket sales must be stalling if promoter Dean Lonergan’s desperate attempts to grab the headlines, are anything to go by. 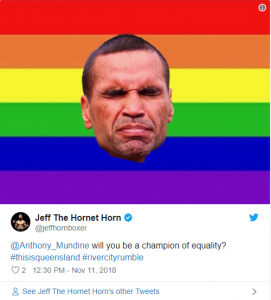 In a bid to unsettle and publicly shame Mundine, Lonergan announced that “ring cards” would be displayed by not only women, but also gay and transgender people, at the “River City Rumble”. “I always tell my gay friend, you’ve got to find a lady … God will judge you, not me,” he said. He has since stated that he will not speak about the issue anymore, instead focusing on boxing. It’s an approach Lonergan would be wise to follow, but he instead attempted to reignite the issue, saying “Anthony has said that he’s not into racial or homophobic slurs anymore and my sense is he will be fully supportive of this,” Lonergan said. Either Lonergan has become a staunch human rights activist overnight, or it was an insincere attempt to capitalise on an extremely divisive issue, furthering the tiresome hero vs villain narrative. In the Fight Promo, Horn’s trainer, Glen Rushton, loosely compared his man’s fight with Mundine to his battle with bullies in school. So whose side are you on? The humble schoolteacher who overcame bullying and embraces people of all genders, cultures and sexual preferences? Or the brash, apparently bigoted, loud-mouth? If the cheap publicity stunt was also intended to get under Mundine’s skin, it surely had the opposite effect. Horn admitted himself that a loss to the veteran could spell the end of his career and Rushton highlighted that “The Man” comes into his final fight with nothing to lose. Australian Boxing’s most divisive star must surely feel that Horn’s camp is now feeling the pressure. But we’ve certainly reached a new low with this reckless attempt to force Australians to a pick a side in this sporting contest, for purely political reasons. Horn has distanced himself from these promotional tactics, confirming that it was his team, not him, who were responsible for the controversial posts on his social media accounts. With the greatest of respect to the social and political issues highlighted, those who tune in to this fight are only interested in seeing which guy can punch the other in the face more. Building it up as anything more than that is simply dishonest. He’s sure to make a decent pay cheque on the night, but one wonders whether this fight will do lasting damage to Horn’s brand in the long-term.